My first thought within seconds of beginning to play this disc was, “Why?” It is not as though we are short of permanent records of Karajan’s conception of Beethoven’s Ninth Symphony. If you must have a live performance – of which Karajan authorised comparatively few, being so prolific in the studio – there is a good mono recording on Audite of the 75th Anniversary performance by the Berlin Philharmonic under him. Again for the historically minded, there’s the 1947 studio recording made under such difficult conditions in Vienna which for all its sonic shortcomings is far preferable to what we have here. The sound is execrable; there is no other word for it and there is no evidence of a re-mastering having had any effect upon its quality. Fuzz, distortion and spatter abound. The chorus’s words are wholly unintelligible; they might as well be singing through face flannels. Orchestral detail is inaudible, except when, for example, the bassoon is playing solo; otherwise all is a fug. As far as I can tell, the soloists – staunch and stalwart, tried and tested names to a singer - are rather good, especially Teresa Stich-Randall and Gottlob Frick, a few aspirates apart. However, there are better testaments to their artistry than this to be found elsewhere. 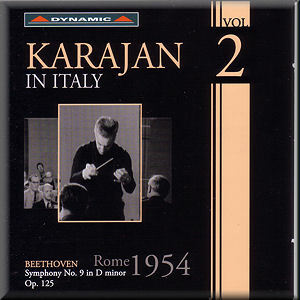 Karajan rarely altered his interpretations or tempi once he had hit upon a working formula and there is little difference in his phrasing or timings between this and his other numerous accounts, so once again, there is nothing distinctive about this version to merit its purchase. Vaguely in evidence is his ability to raise the standard of any orchestra he encountered and homogenise their sound into the one for which he was famous. The RAI Sinfonica clearly responded positively to his autocratic direction. I remain mystified why the Dynamic label thought this was worth the investment.